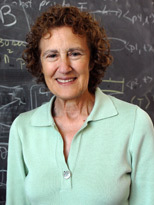 On the occasion of her winning the Turing Award, Institute Professor Barbara Liskov participated in an interview with the MIT News Office in which she discussed her role in shaping the past, present and future of computer science. Q. When you began your career in computer science, it was still a relatively young field. How have you seen this discipline evolve over time -- at MIT and elsewhere? A. The change has been tremendous. When I started, most of the field was unexplored and there were obvious problems everywhere -- lots of low-hanging fruit, but also very fundamental issues that were poorly understood and very confusing. Today the field is on a very sound foundation. There are still many problems to work on, but now this work happens in the context of all that has gone before. When I started, this context was missing, so you just struck out on your own. Q. Looking back at your career, what is the single accomplishment of which you are most proud? A. Probably the development of the concept of data abstraction and the CLU programming language. This work was done at MIT in the 1970s. Q. Where do you plan to focus your research going forward? A. Today I am working primarily on distributed systems -- systems that run on many computers connected by a network like the Internet. My focus recently has been on the security of online storage. I believe that more and more users will store their information online, but the storage they use needs to be implemented so that they don't lose their information, their information is available when they need it, and they can be confident that their confidential information will not be leaked. Q. As the the first U.S. woman to earn a PhD from a computer science department, what advice would you give to other women who are considering going into this field? A. I have found computer science to be a wonderful field to work in. I think the main reason is that the kind of thinking and problem-solving it requires matches my abilities. I believe that finding work to do that you like and are good at is the most important way to find a satisfying career. Young women (and young men) who find that computer science is a match for them should pursue it. There is lots of interesting work remaining to be done. Q. When you began studying computer science at Stanford, computers were big mainframes and the Internet was still in the distant future. Today, computers fit in the palm of our hands -- many are much smaller -- and the Internet is ubiquitous. Given that you have watched these transformations over the last five decades from a front-row seat, what do you think the next half-century will hold? A. I don't have a crystal ball! It seems obvious that computers and the Internet will continue to be very important to individuals, companies and society. But I don't know the exact form this will take.